Nixon and Kissinger, along with John Negroponte, a Kissinger aide and the officer in charge of Vietnam on the National Security Council, arranged a chaos-creating government coup in Cambodia in March 1970. Negroponte would later act as Ambassador to Iraq from 2004 to 2005 and as director of national intelligence from 2005 to 2007. On March 26, 2001, the Los Angeles Times reported, “While ambassador to Honduras from 1981-85, Negroponte directed the secret arming of Nicaragua’s Contra rebels and is accused by human rights groups of overlooking — if not overseeing — a CIA-backed Honduran death squad during his tenure.” The CIA had unlimited funds to assist the government in its depopulation efforts. In concert with Oliver North, “He also helped orchestrate a secret deal, later known as Iran-Contra, to send arms through Honduras to help the Contras overthrow the Sandinista government.”29 Negroponte had charge of the US Embassy in Honduras when hundreds of Hondurans labeled as “subversives” were seized, raped, tortured and slaughtered by Battalion 316, a Honduran intelligence unit trained, funded and supported by the Pentagon and the CIA. Battalion 316 also participated in the CIA’s covert operations in Nicaragua.30 Negroponte was Deputy Secretary of State under Condoleezza Rice. On October 2, 1979, Robert S. McNamara, president of the World Bank and former secretary of defense during the Vietnam War, in speaking to a group of international bankers said, “We can begin with the most critical problem of all, population growth,” concluding that, “Either the current birth rates must come down more quickly, or the death rates must go up...There are, of course, many ways in which the death rates can go up. 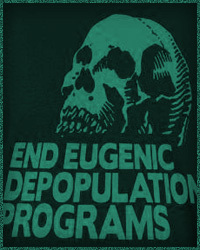 In a thermonuclear age, we can accomplish it very quickly and decisively.” It is a surprising statement in view of the crypto-eugenic position taken by the American Eugenics Society, a stand which McNamara, evidently a dedicated eugenicist, would have certainly been aware of. It can only be assumed that he did not agree with the society’s stand, and was arrogant enough to ignore it.”31 McNamara and Maurice Strong, a Rockefeller operative and ecological agitator, organized the UN Earth Summit in Stockholm in 1972.32 The New York Times claimed that Strong was the “Custodian of the Planet.” Strong is indebted to George H. W. Bush who maneuvered Strong into the position of Secretary General of the 1992 UN Conference on Environment and Development, the Earth Summit, convened in Rio de Janeiro, which elevated global economic and environmental regulations.33 Strong thinks that people should be required to have a license in order to have a baby. ^ The State of Native America: Genocide, Colonization, and Resistance edited by M. Annette Jaimes, South End Press, Boston, Massachusetts, 1992, p. 7 Jaimes Notes: Jacobs, Wilbur R., "British Indian Policies to 1783," in Handbook of North American Indians, Vol. 4: History of Indian-White Relations , Smithsonian Institution, Washington, D.C., 1988, p. 10). As regards inculcation of smallpox among the Mandans in 1837, see Connell, Evan S., Son of the Morning Star: Custer and the Little Big Horn , North Point Press, San Francisco, 1984, pp. 15-6.